Quite often I get the question how I plan my route and which roads I choose. Let me give you an idea of the process. I am in Shillong. I type “Kohima” (main town in Nagaland) in the Google Maps app. Google Maps shows me the fastest route: 12 hours riding time. Because that is too far to reach in one day, I search for a town located at about 6 hours riding and half-way on this route. It happened to be a place called Lanka. So Lanka it was. Riding to Lanka from Shillong meant going straight through the jungle of Assam, yet another state in India. I followed a small road without any traffic, which was winding through the jungle. Large parts were unpaved and required serious off-road riding. On the way I passed small villages were the people who heard me coming were literally eye-balling me. It seemed that I was quite the sight. A large motorbike. A foreigner. A woman. These three ingredients combined and they could not believe what they were witnessing. I was so used to finding small shops alongside the road wherever I rode in India that I never carried a water bottle with me. A habit that I started to regret while riding this route. The sun was soaring, my throat got drier and drier and not a single shop in sight. When I spotted a bamboo construction with mountain water, I took the opportunity. It was some of the most delicious and clear water I ever drank in India! When I reached Lanka after some 6 hours of riding - it was clear to me that Lanka was not a traveller hub. It was a scruffy little town and the accommodation fitted that image. But although the room was not great and situated right next to a Hare Krishna temple (which meant, hours of loud Hare Krishna chanting) - the manager was friendly and let me park my Basanti inside, next to the reception desk. Not having to worry about Basanti spending the night on the streets made all the difference! After spending one night in Lanka, I backed Basanti out of the reception area and took off towards Kohima. 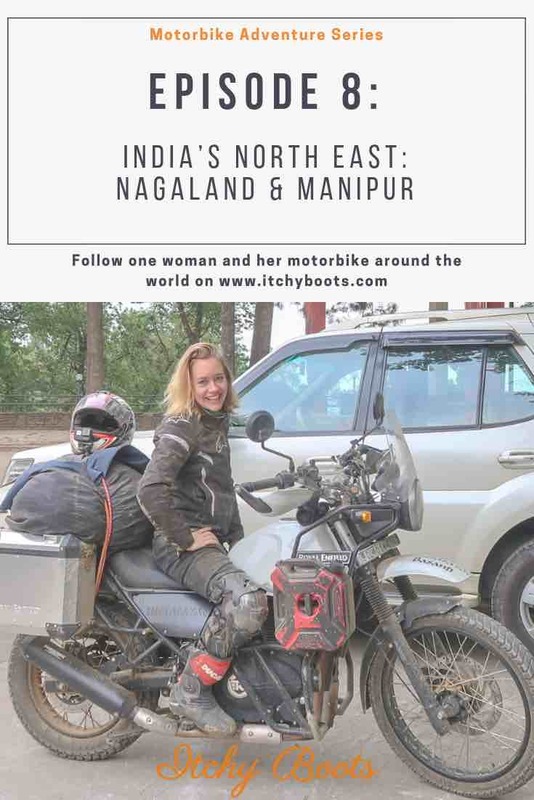 The day started off quite alright, but as soon as I crossed the state border into Nagaland - things changed for the worse. The main road was still under construction and was nothing but an unpaved, extremely dusty and bumpy road. I got several terrible dust showers while riding behind big trucks and could barely see where I was going. I was relieved I didn’t dive off some cliff somewhere. Upon arrival in Kohima - completely covered in dust but still smiling! As if the road towards Nagaland wasn’t bad enough, getting out of Nagaland and into Manipur turned out to be even worse! Upon my arrival in Kohima, it had begun to rain. The rain didn’t stop for another 24 hours. Thinking about what this was doing to the roads, I didn’t wanted to leave Kohima yet. But I didn’t have much choice. I chose to give it a try and see whether the roads were still accessible. It turned out the be the hardest day of riding so far. For hours and hours on end, I ploughed through mud, sand, water and potholes. I had to be one hundred percent focused, all the time. One single moment of drifting off could mean slipping and sliding down a steep drop. Perhaps it was my lack of experience in riding roads like this, but I was riding so tensely and concentrated that I could barely move my shoulders when I finally reached Imphal at the end of day. Each and every muscle in my back was squeezed intensely tight together. It felt like I’d need 10 Thai massage therapists walking over my back in order to straighten them out. … and riding out again. I took 2 days of rest in Imphal after that eventful ride. The back pain slowly got less and suddenly it was my last day of riding in India. Except for a couple of weeks trip to Bangladesh, I’d spent the last 5 months in India. It felt like such a long time that leaving India the next day was a strange idea. I didn’t want to ride from Imphal straight to the border with Myanmar. I read in the Lonely Planet guidebook about a beautiful lake in the state of Manipur, only a 45-minute ride away from Imphal. So I made a detour to ride around this area called Loktak Lake. Not quite knowing what to expect, the lake blew me away. 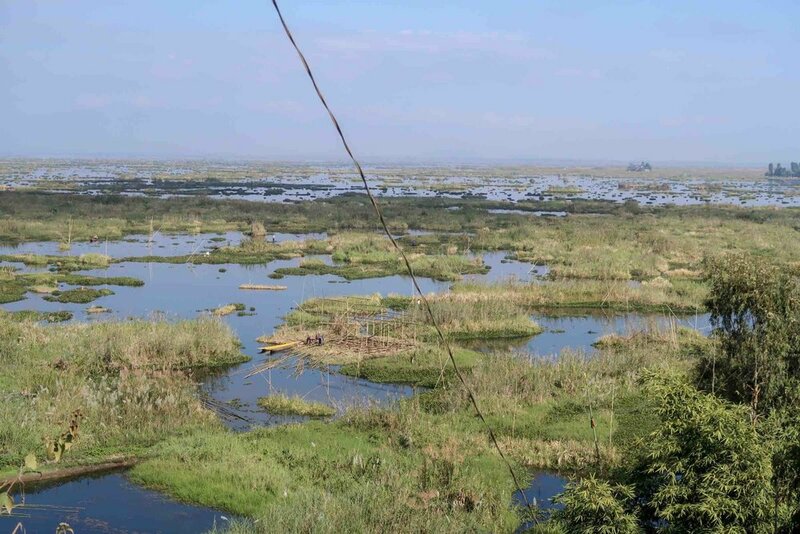 Being the largest freshwater lake in North East India, it is famous for the phumdis floating over the lake: a mix of vegetation, soil and organic matter at different stages of decomposition. The largest Phumdi covers 40 km2 and contains the only floating national park in the world on it! Several endangered deer species call this national park home. Unfortunately I didn’t have enough time to try and get up close to the national park. The last stretch of road towards Moreh, the last town on the Indian side of the India-Myanmar border closed at 16:30 hours, so I had to make sure I reached it in time. But just riding around the edges of Loktak lake was rewarding enough! When I reached Moreh I rode to the hotel recommended to me, but unfortunately it was fully booked. I tried at least 10 other hotels but they were all full as well. It was the first time on this journey that I struggled to find a place to stay the night without a reservation upfront. The place that did have a room for me was extremely grotty. The price matched the quality, so on the bright side: I payed almost nothing. Win! I can’t say I slept well that night. It was probably due to a combination of an extremely uncomfortable bed and me worrying about the coming days. The crossing through Myanmar was going to be in a group. It is not allowed by the Myanmar government for foreigners to ride through Myanmar independently. That means that you need to have a government approved guide with you as well as a government official. The costs of having the guide and government official, amounting to several thousands of dollars, are yours to pay. Unaffordable! So I had no other option than to join a group of riders, share the costs and ride together with them and the guide through Myanmar for the next 6 days.